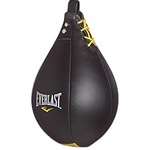 A boxing speed bag also known as a speed ball is used to mainly improve hand-eye coordination, hand-eye coordination helps you to be more accurate and precise with your punches. You don’t wear boxing gloves when hitting the speed bag, just hand wraps or bare knuckles. 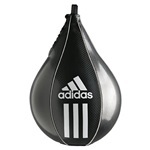 Although a speed bag can be beneficial to your training, a heavy bag or standing punch bag will be much more beneficial. If you already do have access to a punch bag then by all means why not improve your skill set further by adding speed bag training to your workout. 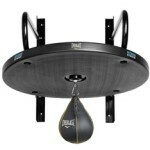 Getting the technique right can be difficult, it does require practice and patience to learn how to hit a speed bag. But once you master the technique, you’ll benefit from improved skills you’ve acquired. 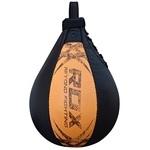 If you’re unsure what size boxing speed bag to buy, then as a guideline, if you’re a beginner you should choose a larger speed ball (10″ height x 7″ diameter) as this will still be easy enough to hit and you’ll still improve your hand-eye coordination. It’s probably not a good idea to go for anything larger unless you’ve never even put on a pair of boxing gloves! 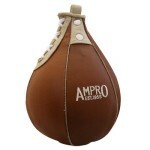 But for most people looking to train with a speed ball that’s not usually the case. You won’t really benefit from a speed ball larger than 10″ x 7″ as it’ll be too easy to hit. For the experienced and veterans choosing a small size (9″ x 6″) or smaller should be ideal as it’ll be more challenging but you’ll benefit more as a larger size will be too easy. Hand-eye coordination – It requires great concentration to be able to hit a speed bag so it bounces back and forth in a steady rhythm, therefore because you know your objective is to hit the speed bag in a rhythm so it rebounds 3 times for every hit, you’ll naturally develop better hand-eye coordination. Rhythm and timing – Hitting the speed bag requires good rhythm and timing, you have to hit the speed bag in a way so that it bounces back and forth in a smooth motion. Should and arm strength – You’ll have your shoulders and arms constantly up when hitting the speed bag, this is going to tire your shoulders and arms but this will help build strength and endurance in those muscles.